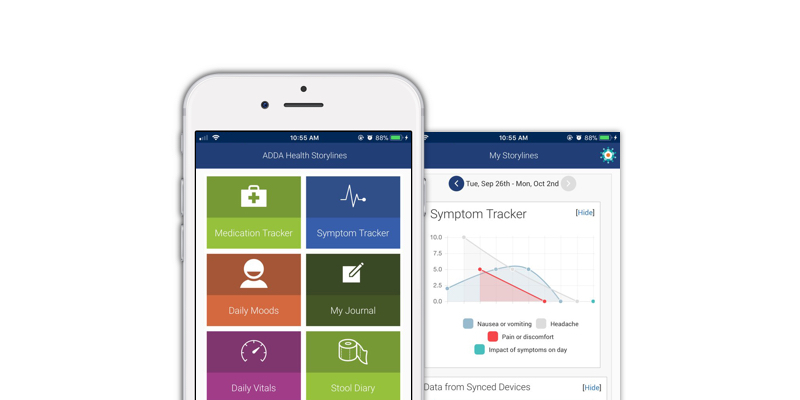 Developed in partnership with the Attention Deficit Disorder Association (ADDA), this app makes it easy to record your symptoms, routines, moods, medication, and more for adult attention deficit hyperactivity disorder (ADHD). Choose what you want to track to build your own health story. This helps you learn more about your health, and share more with your care team, so you both see the full story. BUILD SELF-AWARENESS Track your symptoms, moods and thoughts using built-in tools to quickly and conveniently capture events and their effects as they happen. You can also import data from other health and fitness apps that you use. SET REMINDERS Plan and create a routine and medication schedule, all with auditory and visual alerts. Never miss a dose again. Disclaimer: App only contains medication database for US and Canada at this time. Other countries medication databases coming soon. CELEBRATE ACCOMPLISHMENTS Record completing everyday chores, share insights and capture achievements in the success journal. CREATE GOOD HABITS Build personalized routines and track your weekly progress towards creating successful habits. SHARE THE JOURNEY Every captured event is summarized in a simple view called “My Storylines.” Choose what you want to track, and choose what you want to share with your care team or your loved ones.